New year, new cabinets. Ready to make a change in your kitchen, without the expense and hassle of sourcing and installing all-new everything? 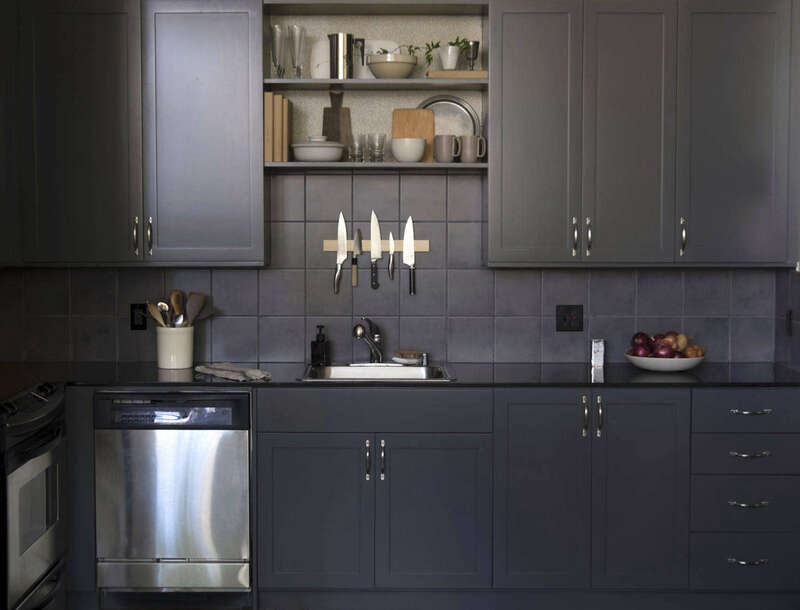 A new coat of paint on kitchen cabinets, when done well, can completely change the look of your kitchen—on a minimal budget. 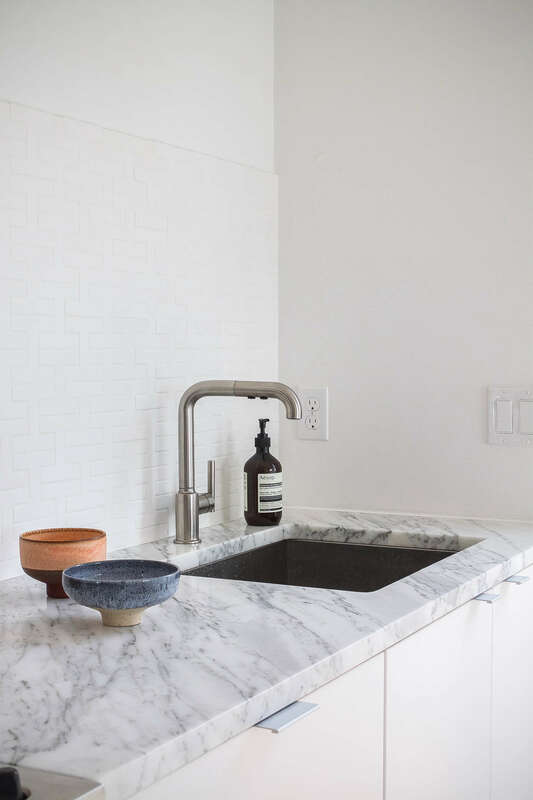 Above: After consulting with an interior designer, Meredith found a paint shade for her unsightly wood cabinets that balances out the dark-colored tile backsplash and transforms the space. 2. You’ll need to label each cabinet panel. Above: Photograph from Ikea Upgrade: The SemiHandmade Kitchen Remodel. When taking cabinet doors off of their hinges and drawers out of their slots, you’ll need to come up with a system to remember where everything goes. Draw a small diagram and label each piece accordingly so you can easily put them back in the correct places once they’re dry. And, you’ll need tape: carefully cover hinges, hardware, and edges with painter’s tape, and countertops with rosin paper or brown builder’s paper. As with any paint job, the more thorough the prep, the better the result. 3. Now is the time to deep-clean. Above: For pantry-organizing tips, see Blisshaus: Bringing Back the Old World Pantry, One Kitchen at a Time plus The Organized Pantry: 8 Rules for Decanting Dried Goods and 7 Favorites: Classic Glass Pantry Storage Jars, both on The Organized Home. No, you can’t keep food in your cabinets while you paint the exteriors. But never fear: now is also a perfect time to organize what you have. Remove everything, lay it out (Marie Kondo style), and weed out unused items. You’ll also need to take the time to clean your cabinets thoroughly, inside and out, with a grease-cutting cleanser, to remove any residue or spills that have occurred over the years. Store foodstuffs in a separate room, if possible, during the painting process, then return them, newly organized, once your cabinets are finished and completely dry. 4. You can come back from black. 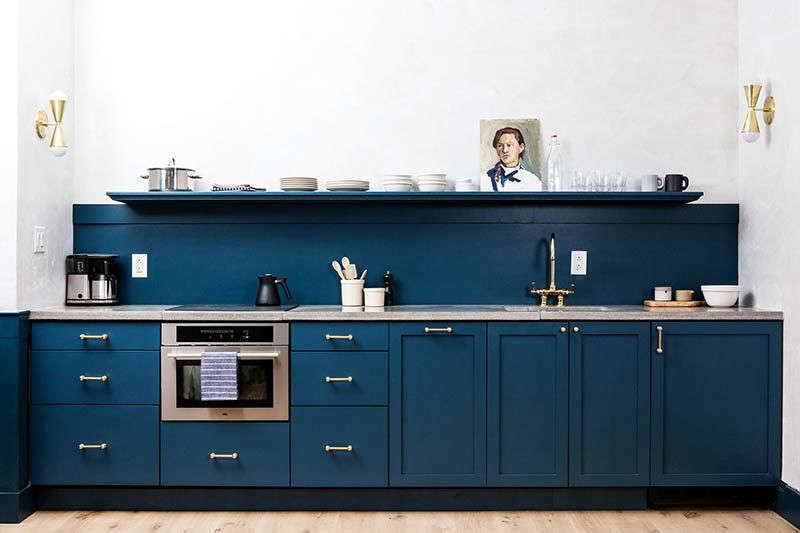 Above: A kitchen in Philadelphia hotel Lokal by Jersey Ice Cream Co., with cabinets painted in Sherwin Williams’s Seaworthy. See more in Trend Alert: The Cult of the Blue Kitchen. 5. Use the hard stuff. For cabinets, forget matte and eggshell finishes, and opt for semigloss, gloss, or satin instead—hardy finishes that are easy to clean. “You want a surface that’s durable and wipeable, so you won’t be painting again for at least a few years,” says Ridge. 6. The magic number? 2 to 2.5. 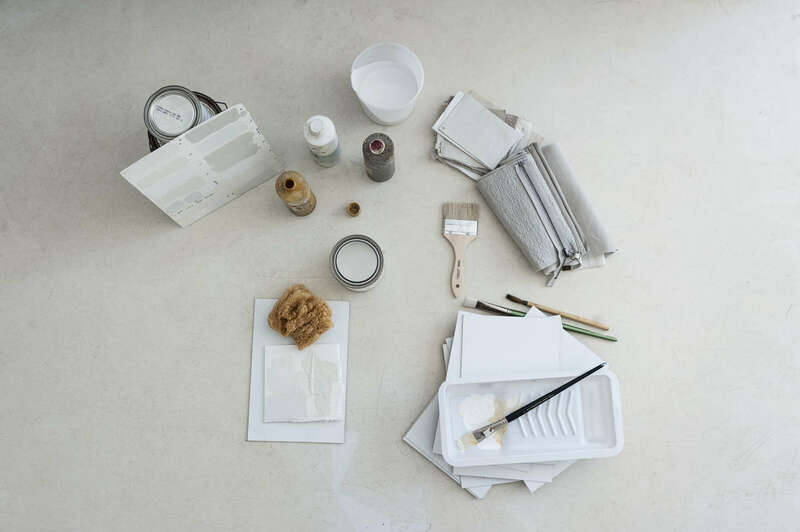 Above: An arsenal of tools and brushes in DIY Paint: Designer Michaela Scherrer Mixes Her Own Shades of White. Drop the roller: to get the best finish on painted cabinets, use a two- to two-and-a-half-inch fine bristle brush instead, which can get in the small corners and details. Or, if you must use a roller, find a mini one that will fit handily on smaller surfaces, then go over with a brush to eliminate roller marks and get into any tiny spaces. For more foolproof painting tips, see Remodeling 101: 12 Essential Tips for the Perfect Paint Job. 7. For a clean, bright look, you can’t go wrong with white. Above: White cabinets meet white walls and a white backsplash in Reader Rehab: A Boston Kitchen Embraces the Light. Advises Berkeley, California-based interior designer Gustave Carlson (a member of our Remodelista Architect and Designer Directory): “I like my cabinets to blend with the room color.” White (his preference is Benjamin Moore’s Linen White) “creates a quiet backdrop for the room’s activities” (and brings light in as well). Opting for a fresh coat of white paint? See more architects’ picks in 10 Easy Pieces: Architects’ White Paint Picks for Kitchen Cabinets. 8. 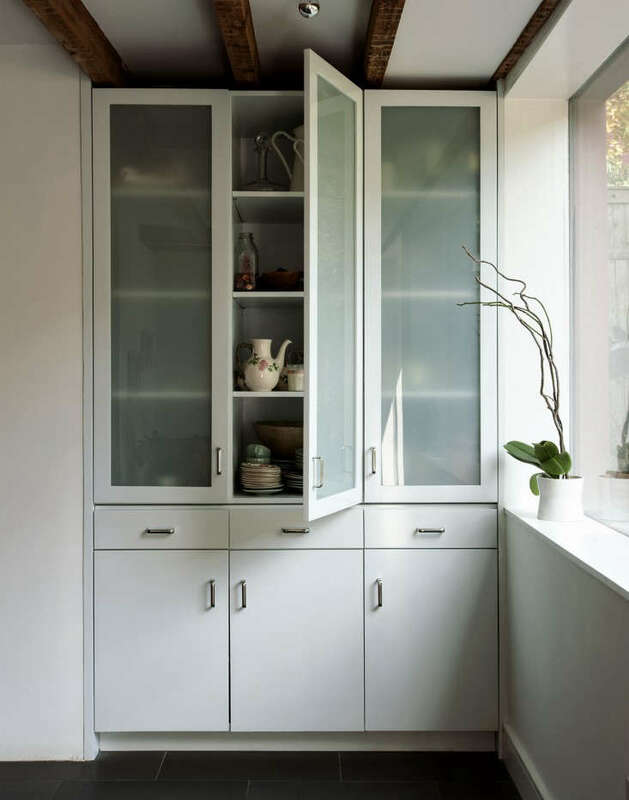 Have glass-fronted or open cabinets? Be sure to paint the interiors, too. Above: A glass cabinet in Rehab Diary: A Hardworking Brooklyn Kitchen by Architect Annabelle Selldorf. 9. Tired of blue? Try yellow. 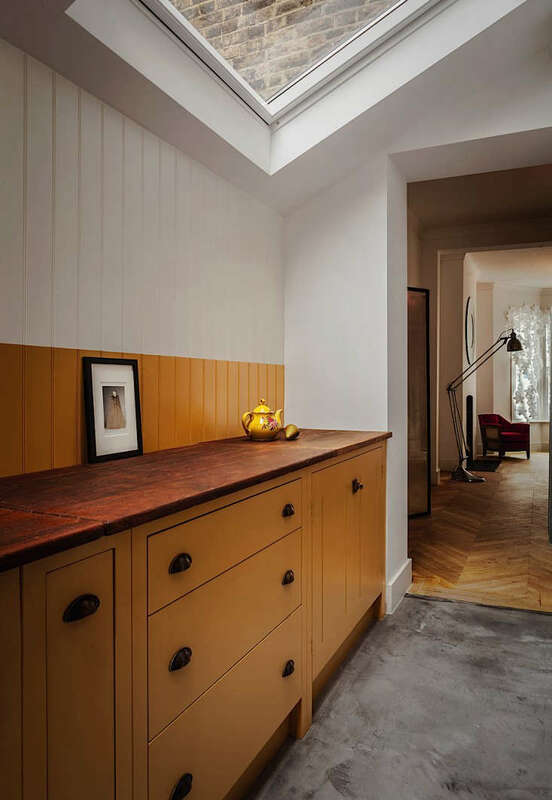 Above: Photograph courtesy of British Standard, from Kitchen of the Week: Stardust in Northwest London. Blue cabinets and green cabinets have had their moments (see Architects’ 12 Favorite Blue Paints for Kitchen Cabinets). What’s set to take off in 2019, according to the Pinterest 100: Top Trends for 2019? Yellow. Give it a try if you’re feeling bold. 10. Feeling impatient? There’s spray paint for that. 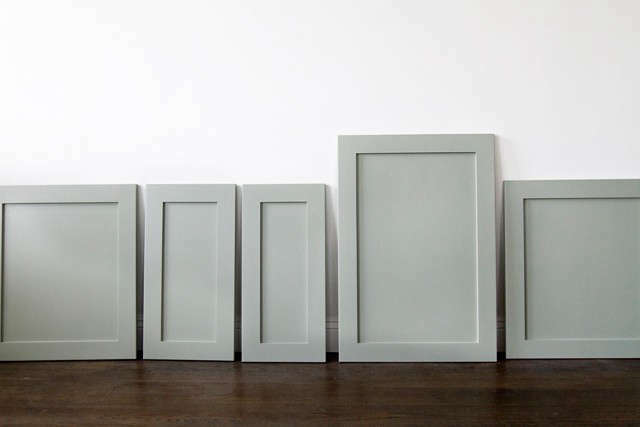 If painting by hand sounds tiresome, it is possible to spray-paint your cabinets. Follow all of the same prep steps with care, then take your cabinet fronts and drawers outside (or meticulously cover everything else in the room) before spraying. Source a professional-quality sprayer and remember this mantra: multiple thin coats, not one thick one.